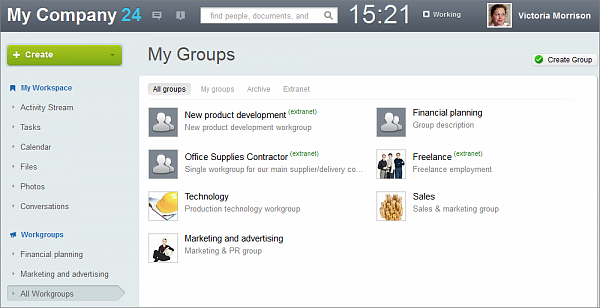 The workgroup is a virtual community of users created for discussing and solving of defined issues, goals and tasks. By uniting users into workgroups for collaboration and projects, all the communications and data related to a given project or team is organized in a single place. 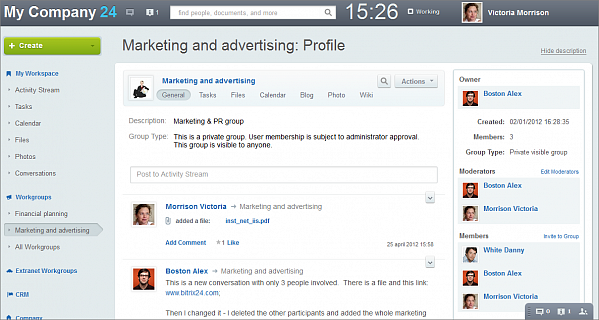 All tasks inside the group can be viewed in relation to each other and access to information can be shared to users outside the group if needed. Group members will see all group activities in the Activity Stream with other updates, and on the group's main page there is a specialized activity stream that shows only group activities. This allows users to keep abreast of events, without excess navigation. After starting the service, there are several preset working groups which can be edited or deleted. An unlimited number of workgroups can be created, and existing groups can be moved to the Extranet to be shared with third parties, or archived after the project is finished. Any user may create a workgroup and be its owner. There is more information on how to create workgroups here.